As per the government of Madhya Pradesh, this year will be full of opportunities for those aspirants who want to make their future bright by doing a government job within the state. Every year, from across the state lakh of students appear in various recruitment examinations conducted by several departments of government of Madhya Pradesh. As far as we know, upcoming Madhya Pradesh government jobs in 2018 will be the most lucrative career options for you guys out there. It is so because the government of Madhya Pradesh offers attractive salary & job security to their employees. Every year, several government departments in Madhya Pradesh release their individual recruitment notifications for both fresher and experienced candidates. The selection procedure of a government job in MP is different for each post. 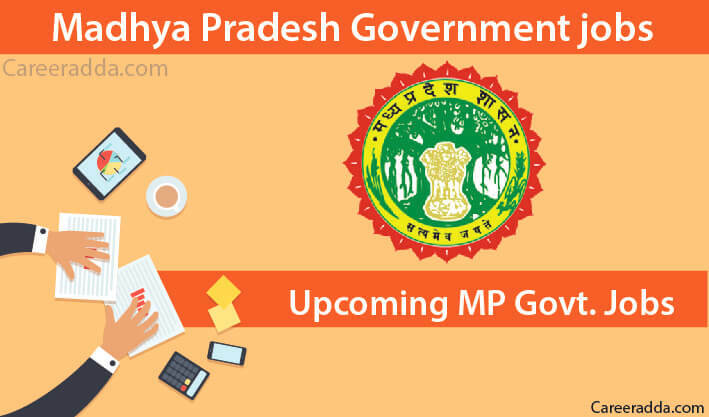 Now, it would be going easier for those candidates who are looking for Madhya Pradesh government jobs in 2018 as here at below, we are providing some valuable information about Upcoming MP government exam in 2018 for those candidates who want to apply for any government job in MP. Selection Procedure: There will be a computer based test (CBT) followed by a skill test/proficiency test; later document verification will be done. Essential Qualification: – An applicant must have passed in 10th examinations from a recognized board; candidates having higher qualifications can also apply to this recruitment event. However, selection will be done on the basis of marks obtained in matriculation examinations. Also, candidate should have the basic knowledge of computer with certificate of minimum 60 days from a recognized computer training institute. Application Fees: Rs. 100/- (no fee for SC/ST/PWD). Candidates have to pay their application fee through India Post e-challan at nearest GPO/Head Post Office. Selection Procedure: Selection will be done on the basis of marks obtained in class 10th examinations. Essential Qualification: The applicant must have an engineering degree in either Electrical or Electronics & Instrumentation Telecommunication or Mechanical or Electrical & Electronics from university/institute recognized by UGC/AICTE. In addition to this, an applicant must have qualified GATE examination in respective branch with respective subject. Application Fees: The application fee for Unreserved/OBC shall be Rs. 1118/- (non-refundable) and for ST/SC/PD shall be Rs. 718/- (non-refundable). Selection Procedure: Selection will be done on the basis of marks obtained in written examination and Interview. Selection Procedure: There will be a written examination followed by personal interview. For those who want to enroll in these exams can go to their respective official site link and check further details. They can get all the information like Job details, vacancy, age limits, educational qualification, application procedure (offline and online), application fees, selection procedure, Last Date for an application form, tentative dates of the exam on this page. Hopefully, everyone will get their dream job and bring success with well-being in order to make life prosperous and healthy. Stay here to check more upcoming jobs in coming months.